Is the winter weather from Winter Storm Grayson or other winter weather throughout the US make you think about moving? Allied Van Lines recently released its 50th Magnet States report. and the highest inbound states for 2017 showed a southern bias! Please read more about the past year's moving trends and let Coleman Worldwide Moving know if we can assist you with your 2018 relocation needs! The annual report uses internal data to track U.S. and cross-border migration patterns with Canada, and found that Florida's net relocation gains of 1,740 keeps it in the leader position from last year. This net gain is calculated by the difference between inbound moves and outbound moves performed by Allied Van Lines, one of the world's largest moving companies. "Florida and Arizona are traditional retirement states and have always been strong contenders for this list," said Lesli Bertoli, general manager and vice president of Allied Van Lines. "For the second year in a row, both Florida and Arizonawere able hold their top-spot positions amongst the other states." Allied's 2017 Magnet States data shows California as the state with the greatest net outbound moves, with 2,718 moves out of state. Illinois (who moved up one spot from the bottom of the list) takes its place as the #2 most outbound state (3,529 outbound moves), followed by Pennsylvania (769 net outbound moves) and New Jersey (623 net outbound moves). Rounding out the bottom 5 is Michigan (550 net outbound moves). 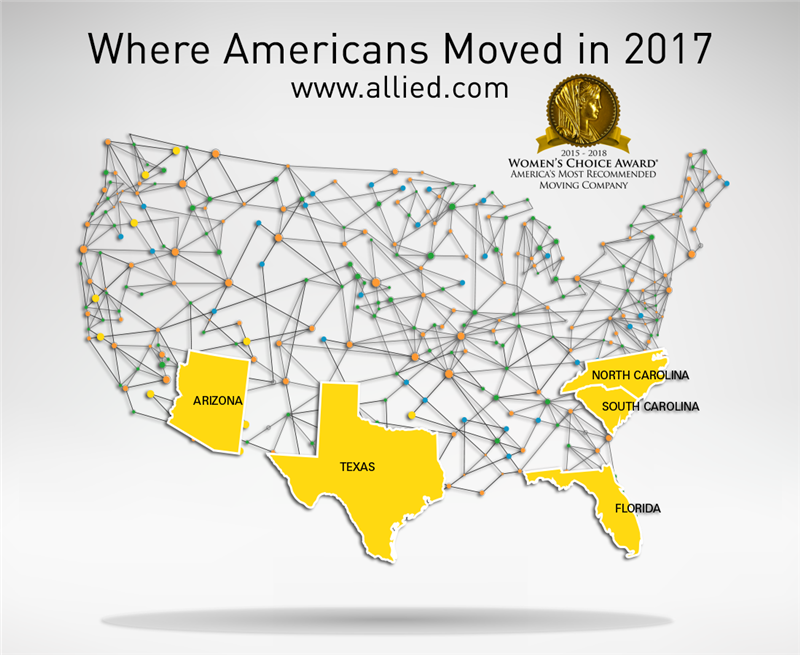 To learn more about Allied's annual Magnet State Reporting, please visit https://www.allied.com/moving-resources/relocation-guides/2017-magnet-report.